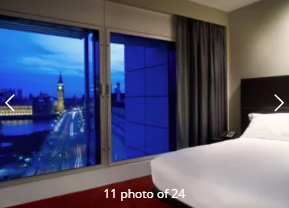 Climbing up the ladder as one of the fastest growing hotel price comparison site, Hotellook currently compares the offers of over 50 different booking websites including the likes of booking, expedia, agoda and kayak just to name a few. The website is lightning fast and I found it to be highly responsive and easy to navigate. Furthermore they prices they display are inclusive of all taxes and additional charges. The homepage design is very simple yet beautifully crafted and informative, you can type in your destination and you will be quickly forwarded to the result page, here is where Hotellook really stepped up their game, not only you have a ton of filters clearly displayed at the top of the page, you can also organise the result by price, popularity, distance from the centre and percentage of discount ( you can find some amazing offers with this option). ​What I was really impressed is that you can scroll through the pictures of any given hotel without actually clicking on the link and being redirected to another page, this to be a great time saving tool as many times you might like the description of the property and guests reviews but you are not entirely convinced by how the hotel looks like. ​The one thing I was not really satisfied is that the support team can be contacted only via e-mail but since most of the bookings will be processed by another agency I didnt think this was a major issue. All together I found the website very enjoyable to surf, on the par of Hotelscombined and vastly superior to Trivago, I can only highly reccommend them for your next holidays. Using a thick reed that grows plentiful, the Uros people built this archipelago as a defense from Incan majority and others. The massive lake has provived safety to the tribe who survived living as fisherman and bird hunters while trading with the Aymara tribe on the mainland. The island are tied to the bottom of the water and to each other with rope cables but their inhabitants can move them around the lake if needed. Until the mid-1980s, most of the islands were located about nine miles from shore and had few visitors but after a devastating storm in 1986 many Uros decided to re-construt their islands near Puno, the largest city on the shore of the lake, this allowed an easier access for tourists. Locals take turns opening up their homes to show what it’s like to live in a building made of reeds, and also wear native costumes for the visitors. The majority of the popultion now works in the turism section. Ryanair, Europe’s No.1 airline, today (23 May) became the exclusive partner of the EU Erasmus Student Network, offering Erasmus students huge savings, with fare discounts, free bags and tailored travel offers.